“It’s been an AMAZING week. Thanks for all the twitter love! ;)” Emily tweeted today (February 1). Pictured inside: Emily, her real-life boyfriend Josh Bowman, and their Revenge co-stars Christa B. Allen, Madeleine Stowe, Gabriel Mann, Connor Paolo, and others filming a funeral scene earlier this week in Los Angeles. Emily VanCamp dons a white dress while filming scenes for her show Revenge on the beach on Monday (December 17) in Redondo Beach, Calif. The 26-year-old actress was joined on the set by her co-stars Nick Wechsler, Gabriel Mann, Margarita Levieva, Christa B. Allen, and Connor Paolo to film what appeared to be [SPOILER] a wedding scene between Jack and Amanda. Revenge returns with all new episodes on January 6! Emily VanCamp hops out of a van and heads to the set of her show Revenge on Thursday (December 13) in downtown Los Angeles. 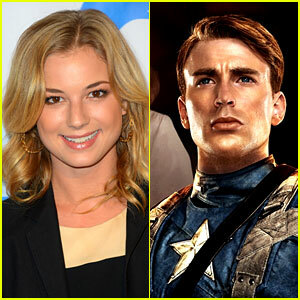 The 26-year-old actress was joined on set that afternoon by co-stars Gabriel Mann, Dilshad Vadsaria, and Barry Sloane. Emily‘s castmate and real-life boyfriend is currently featured in Da Man magazine‘s December 2012/January 2013 issue. “I’m also a private person who likes to keep myself to myself, so when your identity is taken from you, it does become a difficult thing to deal with,” Josh said about dealing with fame. Ashley Madekwe hits the red carpet at the Trevor Project’s 2012 Trevor Live held at The Hollywood Palladium on Sunday (December 2) in Los Angeles. The 30-year-old British actress was joined at the event by her Revenge co-stars Christa B. Allen, Connor Paolo, and Gabriel Mann. Also in attendance were American Horror Story‘s Zachary Quinto, James Van Der Beek with wife Kimberly Brook, and The New Normal‘s Justin Bartha, Andrew Rannells, and Bebe Wood. Justin and Bebe are also pictured presenting Andrew‘s performance. FYI: Ashley is wearing a Kimberly Ovitz dress with Christian Louboutin shoes. Christa is wearing an Emilio de la Morena dress and shoes. Zachary is wearing a John Varvatos suit. Ashley Madekwe and Madeleine Stowe arrive in style to the Mending Kids International’s “Four Kings & An Ace” Celebrity Poker Tournament held at The London Hotel on Saturday (December 1) in West Hollywood, Calif. The two Revenge stars were joined by their cast mates Connor Paolo, Gabriel Mann, and Margarita Levieva. “Playing black jack with the ladies @AdelaideKane & @anitaeat to support a wonderful charity @mendingkids!” Ashley tweeted at the event. “Read about how YOU made the story on tonight’s #Revenge episode happen. SPOILER-ish!” Ash tweeted the next day. FYI: Ashley is wearing a Camilla & Marc dress, Christian Louboutin shoes, Giuseppe Zanotti clutch, and a TopShop ring. Ashley Madekwe & Christa B. Allen: HFPA & InStyle Golden Globes Celebration! Revenge gals Ashley Madekwe and Christa B. Allen are fashion forward at the Hollywood Foreign Press Association’s and In Style‘s celebration of the 2013 Golden Globes Awards Season held at Cecconi’s on Thursday (November 29) in West Hollywood, Calif. The 30-year-old British actress and 21-year-old starlet were joined by a fellow ABC drama gal, Once Upon A Time‘s Lana Parrilla, along with Revenge co-star Gabriel Mann, Eric Stonestreet, and John Krasinski. FYI: Christa is wearing a Emilio de la Morena dress, Christian Louboutin shoes, and a Reece Hudson clutch. Ashley is wearing a Burberry Prorsum dress, Giuseppe Zanotti shoes and clutch, with a Gilan ring.